December 7th, 1941 changed many lives forever. Shortly after the Japanese attack on Pearl Harbor, Nimitz was promoted to head the US Pacific Fleet, eventually becoming commander of all sea, air, and land forces in the Pacific Theater of Operations. In recognition of his outstanding service during World War II, Nimitz received the honor of having a supercarrier named after him. On June 22nd, 2018, the USS Nimitz (CVN-68), one of the largest warships in the world today, celebrated the 50th anniversary of being laid down. In the years before the attack on Pearl Harbor, Nimitz served as the commander of Battleship Division 1, Battle Force before being appointed as the chief of the Bureau of Navigation. For just over two years, Nimitz worked what was primarily a desk job, exchanging the day-to-day running of a warship group with logistics and paperwork. Ten days after the assault on Pearl Harbor, however, after Admiral Husband E. Kimmel was relieved of his duty, President Roosevelt ordered Nimitz’s promotion to Commander-in-Chief of the Pacific Fleet, with the rank of Admiral. Nimitz remained in command of the fleet for the duration of World War II, eventually earning the grade of Fleet Admiral (the highest in the Navy at the time) in 1944. 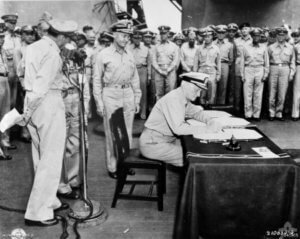 On September 2nd, 1945 aboard USS Missouri (BB-63), Nimitz represented the United States in signing the Japanese surrender documents. Twenty-two years later, Congress authorized the construction of the USS Nimitz, the lead ship of a new supercarrier class. She was launched in May of 1972 and commissioned into the US Navy on May 3, 1975. Currently the oldest active carrier in the United States Navy, Nimitz has completed 28 deployments, five home port changes, multiple overhauls, and over a quarter of a million catapult launches and arrested landings. During her service, she sailed to the Indian Ocean in response to the Iran hostage crisis of 1979, and a failed mission to rescue the hostages was launched from her decks. In 1985, while on her fifth deployment, Nimitz and her crew became involved in the June 14th hijacking of TWA Flight 847. She was deployed to Lebanon’s coast to provide support and remained there for three months. Her warplanes carried out several bombing sorties, including hitting the runways of Beirut International Airport, before the carrier returned to the United States. During the 1988 Olympic Games in Seoul, Nimitz was deployed as security off the coast of South Korea. In the Persian Gulf region, USS Nimitz relieved USS Ranger (CVA-61) in the aftermath of Operation Desert Storm in early 1991 and took part in the Battle of Tal Afar in 2017, providing aerial support for Iraqi troops fighting against ISIS. During her time in service, Nimitz has earned nine awards and decorations, including the Global War on Terrorism Expeditionary Medal, the Southwest Asia Service Medal, the Meritorious Unit Commendation, and the Sea Service Deployment Ribbon. While she’s still going strong, the lifespan of the Nimitz class of carriers was placed at 50 years. USS Nimitz is expected to be replaced by the USS John F. Kennedy (CVN-79) sometime in 2022. The post Named for a Legend: USS <em>Nimitz</em> Turns 50 appeared first on Pearl Harbor Reservations.